300 Million years ago, it is said that the continents looked like this map. If this is the case Florida fit between South America and Africa. As the earth shifted, they became further apart and the oceans came into play. It makes sense to me and since the great giant dinosaurs needed a way to get over to our side of the world somehow, it becomes apparent, they walked. 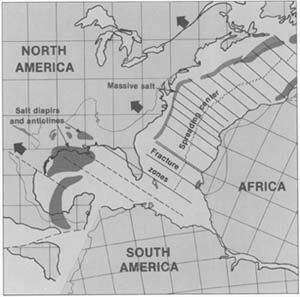 When the earth was in this stage, the continent of the United States was more underwater they you realize. During the Cretaceous Period, actually before dinosaurs, it was like the map below. 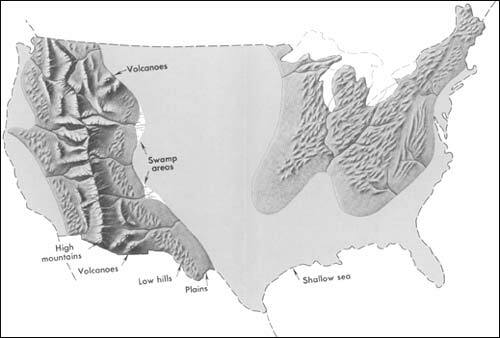 The United States was divided by water, a shallow sea. This Cretaceous Period marked the last extensive covering of the North American continent by the sea. Since then, sea level has dropped and the continent has gradually emerged to its present size and shape. As I started to look at the rocks on our new farm, it was apparent that they were not normal rocks, they were everywhere, I started to dig them out. These rocks seemed to be lined up, especially around the barn area that we wanted to build on. One led to another until I could basically see something important was just under the surface. They had to come out so we could do our work, but there were just to many and to big. Even the tractor couldn't pry them loose. I studied these rocks and how they had rolled down our hill and even then, knew they weren't normal rocks. It soon dawned on me that over time, whatever was at the top of the hill, was pulled by gravity and rolled down. Of course the farmers prior to us, moved the larger rocks to woods lines or piled then here and there. One day, I was at the top of the hill and noticed that a massive rock formation was just on the surface and naturally, I had to dig around it to see if it could be moved. Not a chance but as I uncovered it a form began to emerge, it looked like a forearm joint of a very larger then life animal. It was just sitting there. After a few months and building, all thoughts of digging for fossils were gone from my thinking and the rocks became part of our new house. I used them in the facing walls, outlined rock gardens and just dumped rocks that I deemed ugly into the woods. After four years of forgetting the rocks, I started to find different types as the weather turned the barnyard to mud. One I was able to identify as a claw, another a tooth and then, in the barnyard after the ice storm, all sorts of new unidentified teeth started to come to the surface. My rock digging became an obsession once again. There is no help for me to identify what I have uncovered since the consensus is there were no dinosaurs in Missouri, but I have found some that are not to far from me as the crow flies. Kansas has fossils in shells, raptors, fish and others. Even some larger dinosaurs so if these are truly the big giants, it's time to record the find and get them identified. I have come to the conclusion that what I have is a compressed body. In other words, as the beast dropped and died and time rolled on, the carcass fell in on itself. What I see as I dig is the top of the beast and in the larger pieces if I flip them over I have the other side of the beast with the middle being compacted. Why did they die? It's a question that haunts me. Since I have found various sizes of eggs here and around the area, what happened to suddenly end all of it. Some of the possible Dinosaurs that I might have are: Hadrosaur, Mosasaur, Oviraptor, Marasauras and Late Raptors. What I have found is in hard Red Clay and under that is rock hard sandstone. Here are a few more of my finds. This is in the rock step garden, it is a massive piece that was placed with the tractor. Possible forearm or Pseudo fossil? Looks like a tooth but could be the end of a rib but most likely a Pseudo fossil. All in all, these are fossils of one form or another. A Pseudo fossil is older then dinosaur fossils and technically they are mineral formations from the earth changing and interaction between many mineral and natural chemical compounds. < Same rock after cleaning. Basically, as I cleaned out the red clay and some of the sandstone, these pictures show what the structure was comprised of. There seems to be a ridge of a possible backbone, a disk and my teeth might be ribs or parts of ribs. Pieces I have found in the Red Clay deposit. The smaller one could be a possible disc in a tail. It has the two points that cross for the spinal cord or Pseudo fossils? Smaller pieces I have put in the birdbath, made of these rocks. There is so much of it around here and I am still looking and digging holes all over the place but it's interesting. I can tell you I am not a dinosaur hunter and what I find will be sold to collectors as sculptures.